The Thunderbolt™ 3 eGPU box is a low cost expansion chassis designed to house an external graphics card. Connected to the computer via Thunderbolt 3, the additional GPU power instantly upgrades a regular laptop or a mini PC and makes it possible to do things that would normally require a high-end workstation or gaming computer. For video editors and colourists, the dedicated GPU reduces the time it takes to render the footage, a computer that was not powerful enough for a VR headset is now potentially VR ready and for those that like to play games, these can now run at much higher frame rates than before. 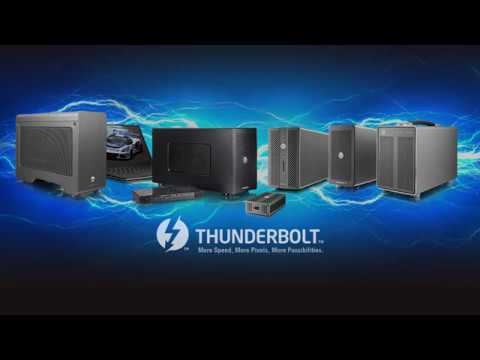 Thunderbolt 3 brings Thunderbolt to USB-C at speeds up to 40 Gbps, creating one compact port that does it all – delivering the fastest, most versatile connection to any dock, display, or data device. In combination with the AKiTiO Node, this makes it possible to instantly upgrade your regular laptop or Mini-PC and achieve a performance that usually requires high-end workstations or specialized gaming computers. Features • Thunderbolt™ 3 for lightning fast transfer speeds up to 40 Gbps. • Includes Thunderbolt 3 USB-C Certified Cable. • 1 PCIe (x16) slot supporting full-length, full-height, double-width cards. • Spacious enclosure for use with standard and large sized graphics cards. • Built-in 400W SFX power supply to provide extra power to GPU. • PCIe x16 slot supplying up to 75W of power. • 4 lane PCI Express 3.0 compliant interface. • Removable back panel for double-width cards. • Carry handle to easily transport the device. • Supports 1x PCIe card. • Supports full-length, full-height and double-width cards. • PCIe (x16) slot provides a maximum of 75W but additional power can be supplied to the PCIe card by connecting a pair of 8-pin (6+2 pin) connectors. • Data Transfer: Thunderbolt 3 up to 40 Gbps. • Fan Noise: 29.6 dB(A). • Dimensions: 42.8 cm x 14.5 cm x 22.7 cm. • 1x Thunderbolt™ 3 (USB-C) port. • 1x Internal PCIe (x16) slot with 4 lane PCI Express 3.0 interface. • Windows 10 Operating System. • Computer with Thunderbolt™ 3 port. • Computer must support external GPUs. • AKiTiO Node with built-in 400W PSU. • Thunderbolt 3 USB-C cable.